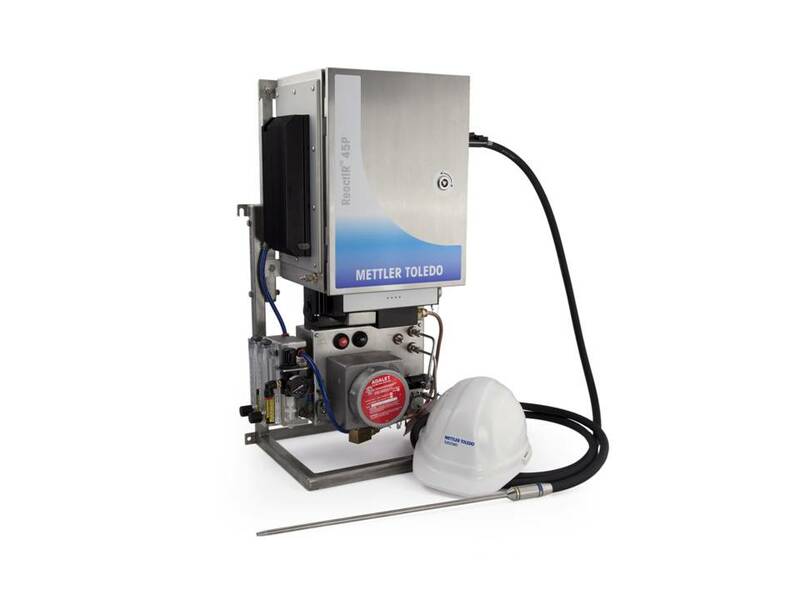 METTLER TOLEDO is pleased to announce the availability of its new ReactIRTM 45P. Next-generation ReactIR™ 45P technology allows reaction scale-up to be studied under actual process conditions. The key information it provides ensures critical yield and product purity are maintained, saving time and money while enhancing safety and compliance in sensitive manufacturing processes. Designed to operate in the lab as well as classified areas, ReactIR™ 45P uses preferred in situ monitoring to study the formation and consumption of starting materials, intermediates and other species in reaction. However, because of its size and unique instrumentation, the same machine can be used as the process is scaled, eliminating the difficulty of transferring calibration data between analyzers. Not only does this enhance time-savings: chemists and engineers develop a direct process understanding and continue monitoring as the process is scaled. This results in fewer reaction surprises and an easier transfer of precision processes from lab to plant. Using proved sampling technology, ReactIR™ 45P, which replaces the METTLER TOLEDO MonArc instrument, has successfully monitored hundreds of chemistry reaction classes, including hydrogenations, Grignard reactions, lithiations, halogenations and acid-chloride reactions. iC series software, including iC IRTM and iC ProcessTM, effortlessly turns this reaction data into chemical information for rapid analysis. Desired reaction goals are reached in less time, allowing companies to compete in today’s fast-paced global market. These robust iC software packages come as standard on ReactIR™ 45P, along with detailed audit and event logs to enhance compliance. A hardened interferometer with multi-level vibration insolation, purge and pressurized NEMA 4X stainless steel enclosure, Thermo Electric (TE) cooler, and DS Series Sampling Technology ensure enhanced reaction protection and environmental control. Full support for Distributed Control Systems (DCS) via industry standard protocols such as Modbus and OPC UA offer robust communication options as well.